Our two year old just loves to eat anything sweet. The problem is that much of the time processed foods taste sweeter than natural ones. I am not sure if it is the taste or his blood sugar levels, but there is a definite appeal of sweetness to the palette. Desserts are often called sweets. In fact, I often enjoy something sweet after meals. I even call my wife "sweetie", so there is an emotional connection and appeal to sweetness. I have also noted that after fasting for a period of time, foods with processed sugars taste aweful to me. Thus pointing out the truth that not all sweeteners are created equal. My hunch is that there is a detoxification and purification that happens during the fasting process. Then, once the body is burning clean, it craves good clean nutrition as fuel. Hence, I am sensitized to the good and bad sweeteners by amplification of the needs of my body. That being said, when a sweetner is desirable, what are the options available? Granulated white sugar - First, we have granulated white sugar. This is probably the most common and most widely recognized sweetener. It is basically sucrose from natural sugar cane, which has been purified. Interestingly enough, sugar has been replaced in many processed foods by high fructose corn syrup. However, after a lot of bad press on high fructose corn syrup, and good taste of sugar. Sugar is rebounding in popularity and showing up on labels of brands you know. This time, it is coming back positioned as a natural ingredient in many packaged foods. In fact, there was an article today in the New York times today regarding the use of sugar by consumer packaged goods marketers as a natural ingredient. Molasses The heavier darker sugars from the purification process are sometimes sold as molasses, which has more nutrients and flavor than white granulated sugar. Brown sugar - So, what about brown sugar? Is this another unique variety? Actually, it is another of the cane sugar cousins. It is white granulated sugar disguised with a thin coating of molasses on the outside. Honey - Honey is the first of our all natural sweeteners with a real health benefit built in. 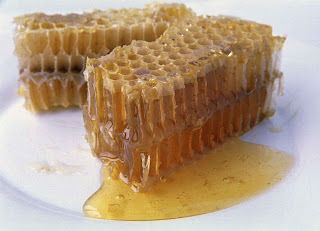 Honey, since it is the product of the nectar gathered by honeybees, is naturally loaded with pollen. This pollen can provide a benefit to your immune system, especially if it is harvested in your local geographic area. Maple Syrup - Maple syrup is another great all natural sweetner, although, it can be a bit pricely. Maple syrup is, as you likely know, the concentrated sap from the sugar maple tree. It is condensed by boiling off the excess water. Because it is harvested from individual living trees only in the fall, it is one of the most expensive sweeteners. Stevia - Stevia is probably one of the most healthful sweeteners available. It is, designed by nature, rather than scientists in a lab. So lets see what Stevia has going for it. Although it is very sweet tasting, it has very low caloric content. Xylitol - Xylitol is similar to Stevia, in that it is very sweet, but has a low caloric content. Xylitol is the sweetener that provides the cooling sensation you find in some chewing gums. High fructose corn syrup - This is one of the players in the sweetner world that has been criticized most heavily as of late due to many alleged health risks. According to an article in wikipedia, high fructose corn syrup" is ubiquitous in processed foods and beverages, including soft drinks, yogurt, cookies, salad dressing and tomato soup." The reason being, is that is has relative sweetness very similar to that of granulated sugar. Brown rice malt syrup - Brown rice malt syrup is a much more natural and healthful sweetener than high fructose corn syrup. In fact brown rice malt syrup is oftentimes made in small batches using enzymes to break down the carbohydrates of the rice grain into its sugar building blocks. Artificial sweeteners: Due to the large amount of sugars that are common in North American diets, it is no wonder that we have an obesity epidemic. It should also be of no surprise that there is an interest in reducing the calories while maintaining the sweet taste of sugared foods and beverages. And, that is exactly what artificual sweeteners deliver. They are sweeter than sugar, so you can get the same level of sweetness by adding less sweetener, and thus less calories. Examples of artificial sweeteners are Aspartame, saccharin, and sucralose. Regarding the potential health concerns related to artificual sweeteners, an article from the Mayo Clinic claims that there is not yet any conclusive evidence. Fruits and fruit juices - Fruits and fruit juices are amongst the safest and healthiest choices for sweeteners.